Force Touch represents the most significant change for Apple's much-lauded trackpad since the debut of Multi-Touch. More than just simple haptic feedback, Force Touch includes pressure-sensitive input that allows entirely new ways of interacting with a Mac. This includes a new input method Apple has dubbed the "force click" action. Users invoke force click by pressing to click, then continuing to press even harder for a second haptic click felt on their fingertips. 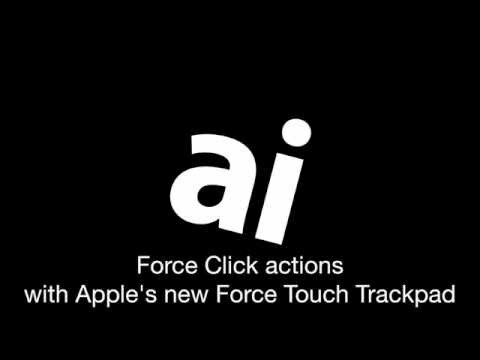 While Force Touch and force click are difficult to describe without actually feeling it yourself, the above video demonstrates some of the functions capable when pressing down harder on the Trackpad. On a new MacBook Pro with the Force Touch Trackpad, users can sample some of these new features in the latest version of OS X Yosemite. In many cases, the new force click feature is simply a quicker way to enact commands that used to take multiple steps. For example, users can quickly bring up the Quick Look view in OS X by pressing hard enough to activate a force click. This allows users to look up the definition of any word, or preview a link in Safari without opening it. In a neat visual cue, the Quick Look view will slowly begin to grow as a user presses harder. Users can vary the strength of their finger press to make the Quick Look view shrink or grow, and pressing with enough force causes the force click input to activate and the Quick Look view to fully appear. Strength of force also plays a factor in QuickTime, where Apple allows users to vary fast forward and rewind controls based on how hard they press the trackpad. Rather than force click, which provides haptic feedback in the form of a "deeper" click, Apple has dubbed this haptic-less variable input method "Accelerators." It's largely the same in OS X Maps, where pressing the zoom buttons in the bottom right also allow users to control zoom at various speeds based on how hard they press. The haptic force click also allows users to quickly add a pin to a location on the map. There are other small shortcuts for force click sprinkled throughout OS X: In Messages, force click allows users to bring up options and media history for a specific conversation, while in Finder, force clicking a file name quickly gives users the ability to rename it. And because the force click action and associated haptic feedback are software-driven, Apple also disables the use of it in some cases, depending on where the cursor is located on the screen. For example, when clicking the menu bar in OS X, there is no force click haptic feedback for a harder Touchpad press. Force click functions are currently limited to the latest 13-inch MacBook Pro models, as Apple did not include the Force Touch Trackpad on the newly updated MacBook Air lineup. It will also be a part of the all-new 12-inch MacBook set to launch this month. Is there any other company that is improving all facets of their products the way Apple does? Porsche, BMW, Toyota, Honda, maybe? I think back to my first white iBook. I thought it was beautiful. Now I look at the new gold MacBook and think what a marvel of engineering. In spite of all the sniveling about only one port, I'm going to trust Apple on this. I look forward to them bringing this to the Magic Trackpad. This strongly reminds me of the aftertouch feature in MIDI music keyboards. I wonder what the granularity of the force touch range is (MIDI aftertouch, I believe is capable of 127 levels, but I doubt most hardware delivers that). It further strikes me that force touch's current implementation is analogous to MIDI's Channel-level aftertouch... basically, on a music keyboard that is so equipped, if you're holding down multiple notes, only the maximum detected pressure across ALL the held notes is applied. Per-note aftertouch is rare ($$), but so much more expressive. If haptic feedback could be combined with a touch screen it would change everything. A haptic on screen keyboard for instance. I am not quite clear - does the new track pad actually move or is it fixed? I think apple is basically genius for removing all mechanical aspects of their notebooks. moving every single thing to software. And apple can now get creative and implement brand new interactions into the mac os x, and all signs point to the actual haptic feedback being granular (softer or harder vibration)..... so potentially in the future you could have a laptop where you literally feel thinks happening on the screen.. This is a big play for the future of the mac computers. and I think with this apple need not worry about touchscreens at least for a long time. Hope they bring it to the magic/mighty mouse. Tried the new trackpad at my local Apple Store. It was bizarre. At first it seemed like real clicks. Real movement and depression of the pad. After a few minutes I started to recognize what was happening as thumps or taps. Almost rather than being the result my pressing, it being the result of someone tapping back up at me from inside the MBP. Freaky. Not in a bad way, but in a different from before, and very satisfying way. I think with this apple need not worry about touchscreens at least for a long time. I'm not sure I understand, but it's worth noting that the first touchscreen to include Force Touch was also the one that introduced the technology. I personally would love love love to see it on an iPad where you can actually rest your fingers on the screen's keyboard without typing and have to press, say, as hard as you would on a regular keyboard before it counted it as a keystroke. I always get a bit of discomfort on the tops of my wrists from holding my hands above the iPad keyboard if I type on it for too long, and this would alleviate that. It isn't a matter of trusting Apple, it is matter of different users having different needs. I'm certain that the new Mac Book will be find for many of Apples customers but it won't meet my needs which is why I went with the 13" MBP. Further it isn't sniveling if you point out a critical missing feature. I see this comment or similar all the time and I have to wonder if these comments come from people that can actually type on a keyboard. A glass keyboard is useless if you can't keep your fingers in place relative to the home keys. Any haptic feed back is after the fact and doesn't help with dealing with drift off the home position. Sure , it is a 'compromise' but it should be better than 'dead' glass. Personally I don't rest my fingers on the keyboard - I am not a touch typer and I don't have a problem with typing on an iPad. I don't think there is a question of giving up the keyboard if you spend most of your day typing, in one way or another. So yeah, I can actually type on a keyboard. I spend most of my day in front of the computer, but I am not a writer, nor a coder. * Press down hard and the list auto-scrolls down fairly fast. * Press less hard and the scrolling become manual and works by dragging down (or up) on the track pad. * If a user is dragging up manually on the track pad, then pressing down hard shifts to auto-scrolling up quickly. That's quite intuitive and much more useful than many of the other uses I've seen. When I first saw the new Macbook introduced, I immediately thought that I wanted a new Magic Trackpad (with force touch) as soon as possible. I don't really use any mice anymore, I've been using a Magic Trackpad for many years now, and I've even gone through a couple of them so far. I'm going to buy the new Magic Trackpad the minute that it is available. But is it patented? I mean really, really patented. This was my impression as well. For the first couple of minutes, I thought I was using an older model with a mechanical trackpad. Can't wait to get a new MacBook so I can play around with it some more. I'm intrigued by the potential for new Accessibility features using Force Touch and particularly Taptic feedback. Perhaps you could feel the edge of a window, feel when your mouse pointer passes over a button, etc. Maybe the there could be a constant haptic feedback to create notches were you could know where you are on the screen without looking at it. That's how it works on a real keyboard for me. The region of my hand just before the finger rests just bellow the keys, and the slight notches the bottom keys make above make it possible to id were I am even with eyes closed (I'm a pretty accurate blind typist :-). Haptic comes from micro-vibrations, so you could feel the pseudo notches if you rest over them.